Mike's Musings ... about Ed Tech ... and Other Things: Do You Know the Way to San Jose? :Reflections on a road trip. Do You Know the Way to San Jose? :Reflections on a road trip. This post is about a recent 3 week trip I took, it even contains some comments related to ICT & education! In July, I presented (along with a colleague) at the "Emerging Technologies for Online Learning" conference in San Jose, California. The presentation was called "Digital Misconceptions: Implications for teaching and learning", you can find out more about it here. I chose to drive to San Jose (with my wife), then up the California coast up through Seattle into B.C. then home through Edmonton after a visit with my son & his family. The journey was memorable for many reasons. First, we saw some amazing scenery, starting with prairie, the edge of the badlands in North Dakota and Montana, to the Mountains and hot springs in Yellowstone, to salt flats near Salt Lake City, the Nevada desert, rolling foothills, vineyards, Giant Redwoods, the rocky Pacific coast and the mighty Rockies in B.C. and Alberta. It is humbling to see the raw beauty of our continent. We also saw temperatures from 40 C in Billings and in Nevada, to 7 C up high in Yellowstone Park to a chilly 16 C in San Francisco. On a technology related note, it is amazing how slow hotel internet is, even in the heart of Silicon Valley! While in California, the number of homeless people struck me, probably because of the nicer weather, although we have plenty in Canada, too. I guess it was because they were so visible, around the hotel in San Jose, at rest stops, on the streets of San Francisco and Eureka, it affected me more than I thought. It was difficult to see so many in need in such a place of wealth. I don't know the solution, but we must try, even if it is giving to food banks or donating to shelters. So many get a raw deal in life, I believe we must take responsibility for ourselves, but some people just need a helping hand. 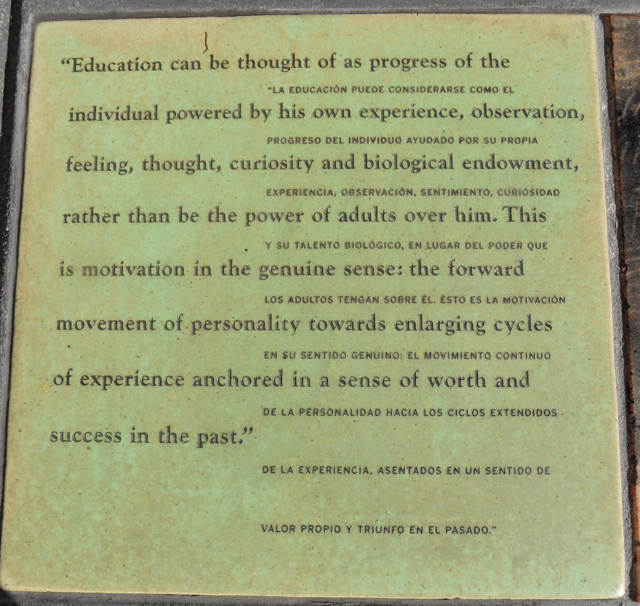 Outside the hotel in San Jose (the Fairmont) was a sculpture and part of it was the plaque with a quote about education. The sculpture was in honour of Ernesto Galarza. 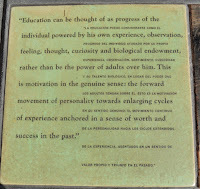 The quote (one of several on the monument) is one worthy of consideration, we must constantly remember that education is for the learner, not the adults who too often hold all the power. We stayed a few nights at Mt. Robson Park in B.C. in a small cabin with an amazing view of the largest peak in the Canadian Rockies. We had no TV, no cell signal, no Internet, just nature and time to read, play cards and enjoy nature. It was hard to do without the trappings of modern life, I would not want to go without for long, but it was nice to unplug awhile. I recommend some unplugged time for all of us, we need time to relax, see the world, slow down and enjoy life! Well, not much here about technology, just some thoughts from a great road trip and a reminder that we need balance, while technology is part of our world and we can't go back (do we want to? ), we must not let it control us, so take a break, look around, take a road trip! Mt. 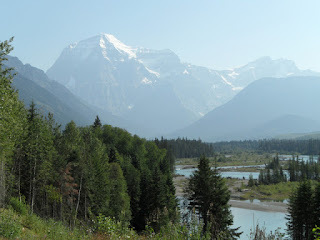 Robson from 'my' cabin @ Mt Robson Lodge. Photos are nice, but nothing beats being there! Hi Jackie,thanks for stopping by & commenting, appreciate it! Why am I reading your blog when I’m supposed to be working on my thesis you ask? Actually, I was able to complete the proposal in three weeks and have spent the rest of the summer revising it (the first draft is in Denis's hands). So that gives me the right to get distracted and add my two cents. Your reflections brought back memories of a trip I took when I was a much younger man. I was a naive and reckless character with a motorcycle who decided he wanted to journey to Lake Tahoe for a running camp. I planned my trip through as many states as possilble, mostly on secondary highways as I wanted to take in as much of the country side as time allowed. I was not disappointed with the beauty and tranquility of the less traveled road. I have many fond memories of that trip (which I some day hope to duplicate on a road bicycle). I could not help but notice the philosophical undertones of your message (Denis did a great job of installing in us the importance of thinking deeply about experiences). We, Canadians and Americans, do live in a world of wealth and abundance, yet there are still so many who are without. I think your philosophical musings are a statement of how we need to re-examine and refocus our value systems. What is it that really matters? It is what we do for one another and not for ourselves that make us human. Something that technology, for all it’s worth, will never achieve. If you are wondering, I did do Western Canada on my motorcycle and the neatest experience was driving through a cloud up in the mountains. And you are absolutely right, sometimes we need to take a break, look around and go on a road trip. After all, we only live once! Hey, roman - thanks for stopping by and leaving your comments. Brave man to take a trip like that on a motorcycle (to me, anyway), must have been an experience of a lifetime. There were many bikers in Yellowstone - was a rally event of some sort. Glad to hear your proposal is in - good luck! Have a great school year - and 'stop by' again! Sounds like a memorable summer. Picture of Apple HQ? I recall visiting Microsoft 15 years ago. It was quite the place then. Sometimes it is nice to be able to let-go of technology, but the demands of our system just don't allow it. We need to keep up. Interesting that Roman surfaced. Hi Roman!